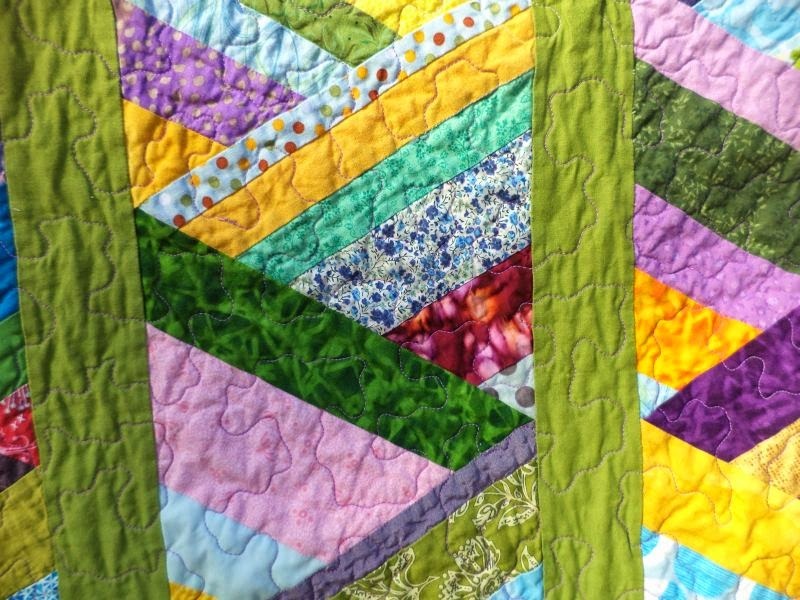 It's time once again for the Bloggers' Quilt Festival, hosted at Amy's Creative Side. This year I am entering my string braid quilt into the scrappy quilt category. 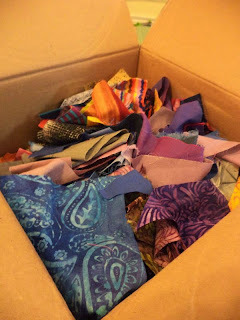 This quilt was the second in a set of scrappy string quilts that all came about because the very generous Judy @ Quilt Paradigm sent me a LARGE box of scraps she wasn't going to use. 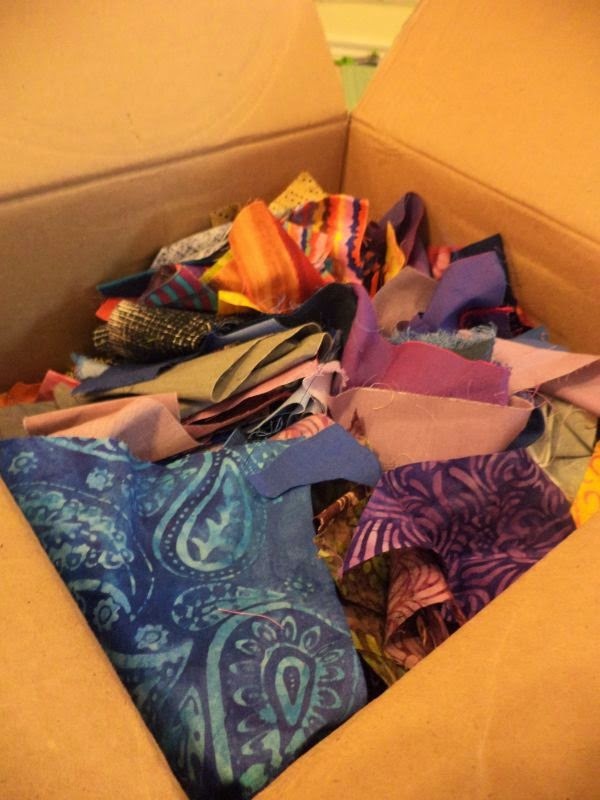 Among the scraps were a lot of string which pushed my string storage beyond capacity, quilts had to be made! 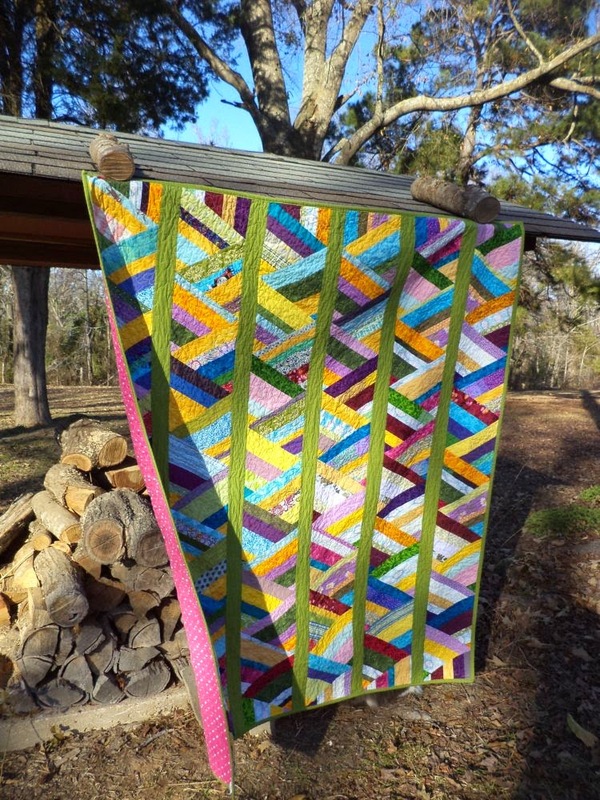 This quilt is made from a series of string pieced 60 degree triangles (tutorial here) set into columns. I stippled the whole thing with a variety of thread colors. This quilt was actually one of my first quilts to go toward the charity I started back at the beginning of the year, Covered in Love. I am collecting quilts to be donated to the families of patients who pass away in the hospital where I work. I actually had the immense honor of giving this quilt away personally. One of my coworkers suffered a late term miscarriage and was in the hospital to be induced and have her baby. I got to take her this quilt and she was so grateful and comforted by it. I wish I could have taken a picture for you of her hands holding her rosary, crossed over her pregnant belly on top of this quilt, but it wasn't the time. Over a dozen quilts have been distributed and they have all been received with tears and gratitude, bringing comfort into despair. If you might be interested in donating a quilt, top, or blocks for Covered in Love please check out the main page. I promise they will go to people in need, and they will be treasured! Thanks for visiting! 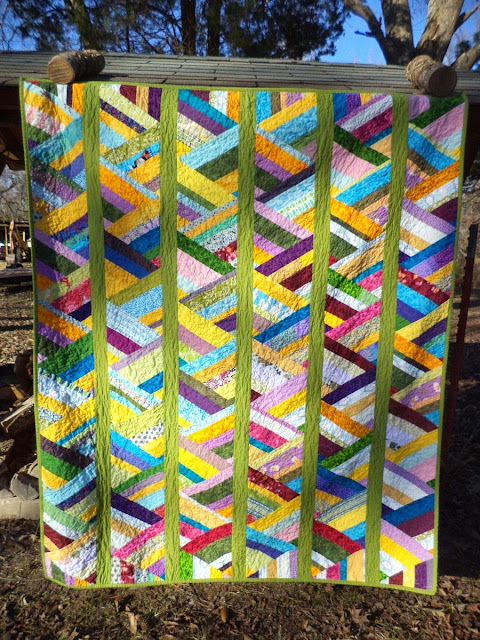 Be sure to check out my other entry in the ROYGBIV quilt category here and visit the rest of the festival! I love the colors. Great job and an awesome charity. Beautiful! 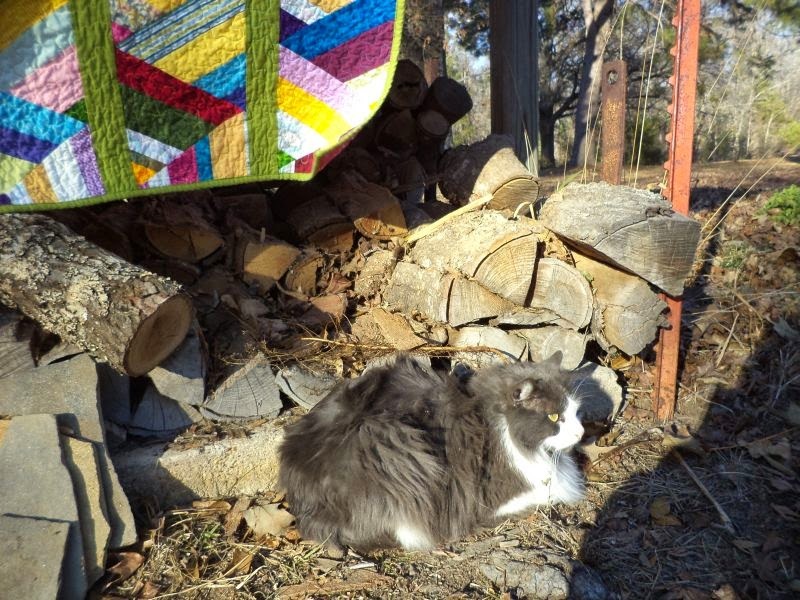 You bring sunshine and loving warmth with your quilts. Looking at this quilt makes me smile :) So glad that it provided comfort to your coworker at a time that is filled with so much despair. Kat, beautiful story behind this lovely quilt. 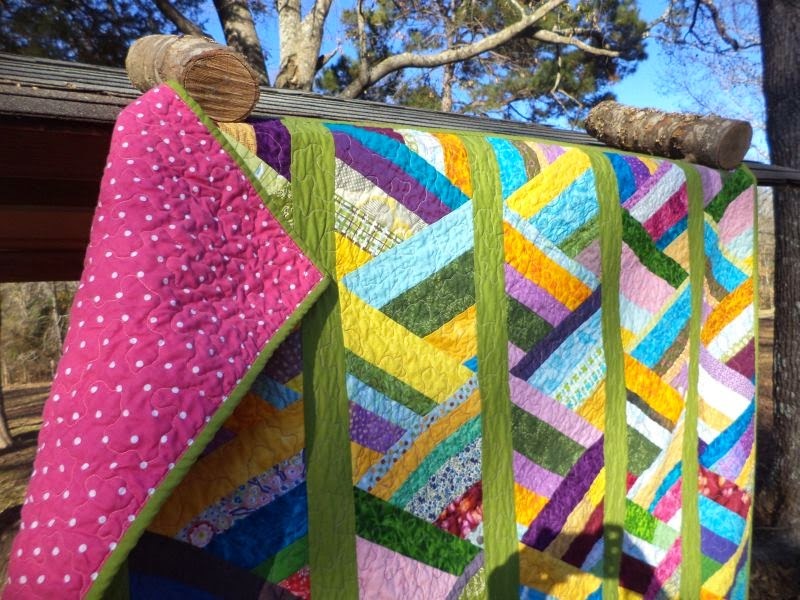 I can imagine the gift your quilt became for the woman who lost her baby. Words can't express the loss one feels. Thank you for all your kindnesses to those who need them most. I'll be looking for your quilt over at Amy's. It's just beautiful. I thought the quilt was beautiful even before I read the story. Very pretty. I love string quilts. I may have to try this design! Thanks for sharing. Neat piece - really great use of scraps. Love it.